Find an apartment to rent in Benidorm with our partners and advertisers below and don't miss out on Benidorm this summer. Contact the advertisers directly to enquire about any special last minute deals they may have! Once you've booked your apartment in Benidorm, don't forget to go to our Benidorm Flights section to book your flights! The apartment featured to the right >> is named the 'La Mar' apartments. 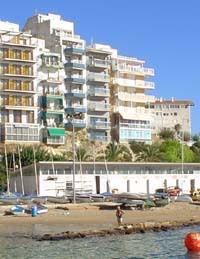 The apartments are in the centre of the historic Old Town of Benidorm, near the Church. Overlooking the sea, you can marvel at the views across Benidorm port, Poniente Beach and La Cala Benidorm bay. On a clear day you can make out the skyline of Alicante in the distance. Benidorm Apartments A collection of apartments available to rent in the historic Old Town and the vibrant New Town areas of Benidorm. All apartments are close to shopping, bars and restaurants. Ideal for anyone. "Apartamentos turisticos para alquiler en Benidorm." At Benidorm Spotlight you'll find everything you need to plan and book the perfect Benidorm Holiday. The site is full of local, insider knowledge with many tips for things to do and see, both in Benidorm and the surrounding Costa Blanca. As well as a holiday guide, you can check availability and prices for over 70 quality and excellent value-for-money accommodations - ranging from 4 star luxury hotels to cheap and cheerful holiday apartments. With so much to choose from in this exciting and vibrant resort, you can trust Spotlight to help you make the most of your valuable holiday time and money! See you on a Beni-break soon! Do You Own an Holiday Apartment in Benidorm? If you own an apartment in the Benidorm area and would like to advertise it here or have a rental agency and would like to be included on this page, please Contact Us. Our advertising fee is extremely competitive considering the excelent placement and search engine ranking that CentricTravel.com's Benidorm Guide receives. If you're serious about your business in Benidorm then this is the place to be seen by customers.